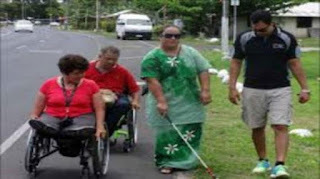 The United Nations Human Rights Office for the Pacific has welcomed Samoa’s and Micronesia’s ratification of the Convention on the Rights of Persons with Disabilities (CRPD). On December 2, Samoa ratified the Convention which was adopted by the General Assembly on 13 December 2006 and on Wednesday, Micronesia became the 171th State party to the Convention. “By ratifying the Convention on the Rights of Persons with Disabilities, the governments of Samoa and Micronesia have committed to improving the lives of persons with disabilities which is a very encouraging step forward,” said Chitralekha Massey, Regional Representative of the UN High Commissioner for Human Rights’ Pacific Regional Office in Suva, Fiji. The Convention’s aim is to ‘protect and ensure the full and equal enjoyment of all human rights and fundamental freedoms by all persons with disabilities, and to promote respect for their inherent dignity’. Ms Massey said its main message is that people with disabilities are entitled to the full spectrum of human rights and fundamental freedoms without discrimination. To that end, the Convention promotes the full participation of persons with disabilities in all spheres of life, challenging customs, stereotypes, prejudices, harmful practices and stigma relating to persons with disabilities. “In the 10 years since its adoption, the Convention has been one of the most quickly ratified of all the international human right treaties. In October this year, the UN Human Rights Office held a regional training on the Convention on the Rights of Persons with Disabilities with the aim of increasing the understanding of the Convention and the capacity of States to implement it. “I am pleased that also due to OHCHR’s contribution, the governments of Samoa and Micronesia took this important step of ratifying the treaty. My office stands ready to support both governments in their efforts to implement the Convention,” said Ms Massey.